Thanks for waiting an extra day this week for your Gooseberry weekly highlights — yesterday we celebrated the biggest holiday of the year: the Dutch King’s birthday! (Which is really just an excuse to have a big party while wearing orange.) Don’t worry, though, there’s some big news here (from VSE fixes to a whole new ending for the pilot) that should be worth the wait! The weekly began with an announcement from regular guest Martijn Berger: if you haven’t heard yet, Blender is now available on Steam! You’ll find versions for Windows, Linux, and Macs there. 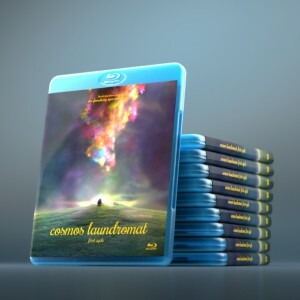 Mathieu has come up with a new cliffhanger ending for Cosmos Laundromat, with new tornado footage, a new jungle dialog (Tara and Blinky are back!) and a laundromat credits sequence. (Please note that these are placeholder credits for now, and not final. And the jungle dialog, recorded by Mathieu and Sarah as a test, will change, too!) Check out the new ending at 2:45 in the weekly video (or the watch full edit to date in Mathieu’s weekly folder on the Cloud), and then stay tuned to see how this new material develops! Beorn also began working on continuity between the various shots made by various people. You’ll find a before & after-style video showing his work on this (plus the two full animations above) in his weekly Cloud folder. Hjalti took a little time to put together this shot of Victor smiling as the tornado hits. We’re pretty sure his inspiration was the stracciatella ice-cream cone he’d had earlier that afternoon. Hjalti, however, spent most of the week working on Franck’s run, as seen when he’s fleeing from the tornado. In his weekly Cloud folder, you’ll find not only both the animations mentioned above and the latest version of this animation, but also grid animations showing the progression of this running shot from every angle: getting more and more clumsy and panicky as they go. Sarah also moved on to a new shot this week: the sequence in which Victor convinces an embittered Victor to give him just a moment of his time. See her animation so far in her weekly Cloud folder. Next she will work on Victor’s side of this animation while polishing Franck’s. Sarah also recorded her entire week of work (and other computering stuff), so expect a tutorial or blog post about her process to follow! In addition to creating the new website for the Blender Institute’s first commercial feature project, Agent 327, Pablo has made some dramatic lighting changes to sheep island to better capture the depth and complexity of Franck’s furry coat. Here’s where the lighting wound up by the end of the week, but check out the before and after video renders as well in Pablo’s weekly Cloud folder. He even gave some attention to the important characters called “branch” and “grass”, which needed some better motion and interactions. The dupli-instance-based grass he animated using the individual meshes (which lends a somewhat random effect, so is kept subtle). The interactions with the branch he did using a particle-instance modifier (perhaps it should be renamed the particle-array modifier to make it clear it does not actually use instancing), which distributes one big mesh across the surface. 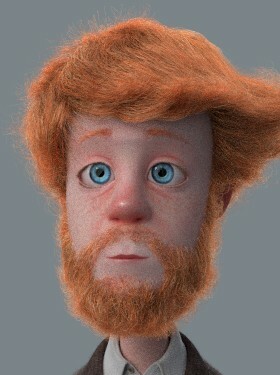 Check out a few of his test sims here (“proof of concept” and not final) and in his weekly folder on the Cloud. Lukas worked with him on these tests and sims, himself testing the wind in Franck’s fur. In the video here (also in Lukas’s weekly Cloud folder) you can see some tests on the wind in Franck’s fur: which needs to be visible but not too turbulent! Then, of course, Andy turned back to the tornado… Here you’ll find the various simulations he’s been testing, including some of Franck running from the colorful smoke, seen from near and far, and ending in the ultimate render to date of the tornado emerging from the washing machine drum (without any missing frames, but still with the extra blue puff that will be masked out). Naturally, you will also find all of these in Andy’s weekly Cloud folder! 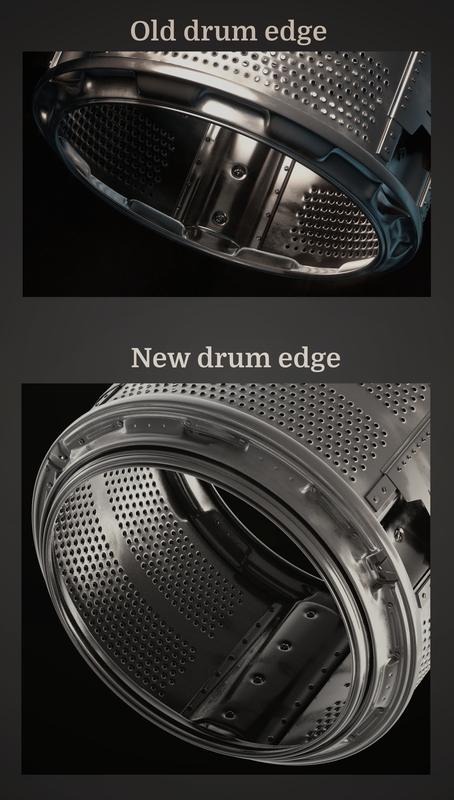 Manu also spent some time this week detailing the edge of the washing machine drum from which the tornado emerges. Finally, Manu also spent some time on the island grass, working on the long-shot views, starting by converting the low-res version Mathieu had made to a high-res version. Then he looked at the layout of the cameras throughout the scene, creating a graphic to represent the positioning in the tornado series of shots. He also made a density graph to show how the grass should be grouped relative to the position of the camera. You’ll find Manu’s weekly Cloud folder, with all of the above, here. Antonis has been busy making the team’s (especially Mathieu’s and Sarah’s) wishes come true again this week. The Sequencer will now add images to the sequence as you render. Just tick the “Use Placeholders” checkbox. In the graph editor, you can now quickly select a curve with all of its keyframes by double-clicking. Finally, Antonis worked with Julian to create a patch for the metadata project Julian was working on to store the metadata within the file, even outside Blender. You can now control the metadata output via a new section of the interface (now in Master, too). Watch Antonis demo it all at 15:22 in the weekly video. In addition to working with Andy on the grass and fur sims, Lukas made an info tool for caches, which can read any Alembic/cache file and give you an overview of all the data. (Warning: calculating the size takes some time!) See his demo at 48:32 in the weekly video. I definitely like the edit ending on the continuation, so hopefully people will want to support the project and see where it goes. I am also super happy that the dialogue on that final scene is just for placeholder… cause it needs a ton of work, haha. As I posted on twitter… the video is still not available for Germans. It shows a GEMA message again and tells us that it contains music from Sony Music Entertainment. Apart from that: Awesome work again – It’s incredible what you’ve completed until today … Keep up the great work guys – I’m proud of you! Yes, thank you, we have noticed this. Very odd, since the production secured the rights for this song months ago. It’s being looked into! Great to see even more improvements to the VSE :) ! The upbeat ending is great. teared up a little. I really like that new ending (for the pilot anyway). Out of curiosity, if the pilot is successful, will you go back to the longer jungle scene (with Tara hatching and the motofly and all) for the feature-length cut? It seems rushed for Franck just to accept his new caterpillar self, and I think he should get a little longer to fall in love with Tara. Plus, the motofly was hilarious in the original concept.